WASHINGTON (Reuters) - The outcome of the latest immigration case involving President Donald's Trump administration to come before the U.S. Supreme Court could hinge on his two appointees, conservative Justices Neil Gorsuch and Brett Kavanaugh. Gorsuch, appointed by Trump last year, questioned the scope of the government's power to detain people without hearings. In April, Gorsuch joined with the court's four liberal justices in a 5-4 ruling in another immigration case that could hinder the administration's ability to step up the removal of immigrants with criminal records. Like some of the other five conservatives on the court, Kavanaugh asked questions of lawyers in the case that seemed more sympathetic to the administration's stance. It was his second day on the bench after being confirmed by the Senate on Saturday following a fierce confirmation battle. Liberal Justice Stephen Breyer, expressing concern about the practice, noted that providing hearings for those held in detention is a long-established right "in a country which gives every triple ax murderer a bail hearing." 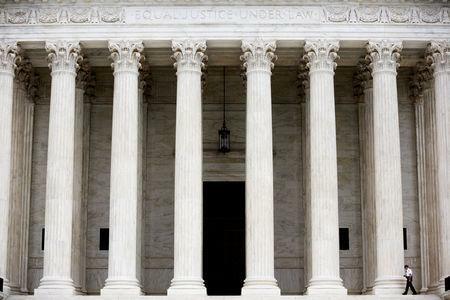 In some ways Wednesday's argument mirrored the split among the justices shown in a 5-3 February ruling, with the conservatives in the majority, that curbed the ability of immigrants held in long-term detention during deportation proceedings to argue for their release. That decision overturned another 9th Circuit ruling. "Is there any limit to the government's power?" Gorsuch asked. The law at issue states that the government can detain convicted immigrants "when the alien is released" from criminal detention. Civil rights lawyers for two groups of plaintiffs argued that the language of the law shows that it applies only immediately after immigrants are released. The administration said the government should have the power to detain such immigrants at any time. "I don't know what is reasonable in this situation. A month?" Roberts asked. In questioning Wang, Kavanaugh said the ACLU's request for a time limit "raises a real question for me whether we should be superimposing a time limit into the statute when Congress, at least as I read it, did not itself do so." But Kavanaugh later asked administration lawyer Zachary Tripp what a reasonable amount of time would be if the court sided with the immigrants. Tripp called any time limit "profoundly problematic."